When Blizzard added Achievements in patch 3.0, they also added a less noticed feature called “Statistics”. It’s that fun little page that tells you how many times you’ve killed Hogger, and how many times you’ve died to falling damage (5 for me…) Of course, it only records your statistics starting from patch 3.0, so all the stuff you did before then doesn’t matter, unfortunately. Well, the other day while I was waiting in the Random Heroic queue, I decided to have a closer look at my statistics, and I found a few interesting things. No world honorable kills? Hm, that’s odd. Alright, moving on… if you know anything about me, you know that I don’t do Arenas. I’ve set my foot in their once, right after they were released in BC, and that was it. But since it was so long ago, it shouldn’t be on my statistics page. Woo! They got one right this time! I bet I’d have a pretty good arena rating if I’d really killed 25 but only died 3 times! 779 + 294 + 957 = 1792, right? WRONG! It equals 2030. That means my “Total Honorable Kills” is off by 238. It would have made more sense if it was 294, meaning the weren’t counting my imaginary arenas, but no: 238. I decided to hang out with Ghugh most of the weekend. I’m finding that the more I play him, the more I love him! Ret Paladins are so OP. Got him from 46 to 51 this weekend, as well as a boatload of achievements. The strangest part of my weekend though was getting the [I Found One!] achievement on Ghugh. I didn’t bother with any of the Noblegarden stuff (already did it on Brajana and 2 other alts). 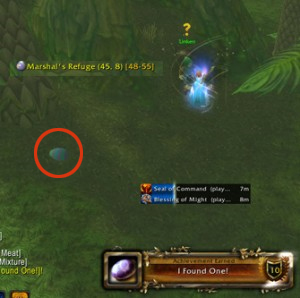 But as I was questing through Un’goro, I stumbled upon an egg. Why would someone put an egg here? And why wouldn’t they open it up? Who knows! But it was about as free as an achievement can get. I also spent some time in Alterac Valley at 51. Determined to get my [Ice Barbed Spear], I suffered through a 50 minute Alterac Valley war of attrition. It was painful, as the battleground was full of level 60 Death Knights decked out with 10k HP, when little me had barely 3.5k. But I got a boatload of achievements as well as picking up the spear, so I certainly can’t complain! Hope your weekend was as much fun as mine! Alright, so I have a dilemma. When I gear, I tend to gear focusing only on my AP/Agi/Hit/Crit… and I sort of let my health and mana numbers follow along. But now I’ve got a problem. My health is a measely 7704… not nearly where it should be in the late T5 raiding scene! So this needs to be fixed. In my race to do the highest damage I could, my peccadillo was sacrificing my survivability. Any advice? I suppose PvP gear might help, eh? I don’t really have any, and I have never been able to get an arena team together for some points. Which gear pieces should I sacrifice for the extra health? If anyone would be generous enough to check out my Armoury page and make some recommendations… I’d be very grateful!